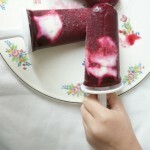 Cool off with a deliciously simple cherry yogurt popsicle..perfect summer recipe the kids can help make. The first step in making these popsicles is turning cherries into a sweet sauce. Place the cherries, sugar, water and lemon juice in a small sauce pan. Bring cherries to a boil over medium-high heat. Once the mixture comes to a boil, bring the heat down to medium-low and simmer until the cherries soften. Use a potato masher to gently smash the skin off the cherries and help with the breaking down of the cherries. When the sauce thickens, about 10 minutes, remove from the heat. Place a fine sieve over a medium sized bowl. Pour the cherries into the sieve and use a spatula or, the back of a wooden spoon, to press the cherries through the sieve. At this point we removed the pits and did a little more pressing. Set the sauce aside to cool completely…preferably overnight in the fridge. Pour the cooled cherry sauce into the popsicle mold…fill the mold half way. Scoop 2 tsp of yogurt into the mold and top up the mold with cherry sauce. There should be enough sauce for 4 popsicles, at least. Freeze popsicles at least 8 hours…then remove and enjoy.